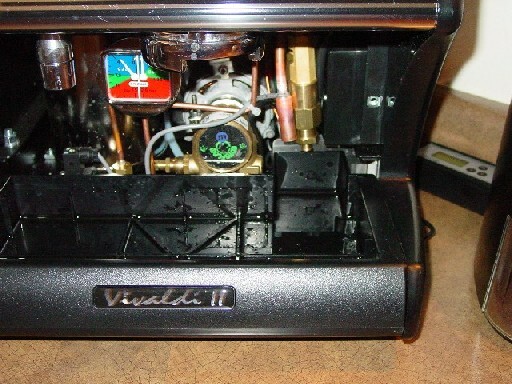 After much research when looking to upgrade from my little Gaggia Coffee, I decided on the VII. It arrived last week, I unpacked it (beautiful! ), but I didn't have time to install everything until the weekend. I had read enough negative "first day" experiences here to be somewhat prepared for the same. The machine worked exactly as advertised. Of course the manometer was askew. Easily tweaked. The drain kit was a bit odd and installation made my drip tray rock -- easily fixed with a few strategically placed felt pads underneath. Works just fine. Also noticed the drain pipe from the 3-way valve was spitting water just outside the drip tray. With some careful tugging and repositioning, that problem is resolved as well (though I'd like to extend that copper spout about 3/4 of an inch to minimize splash...any ideas out there?). As for the espresso itself -- first rate! 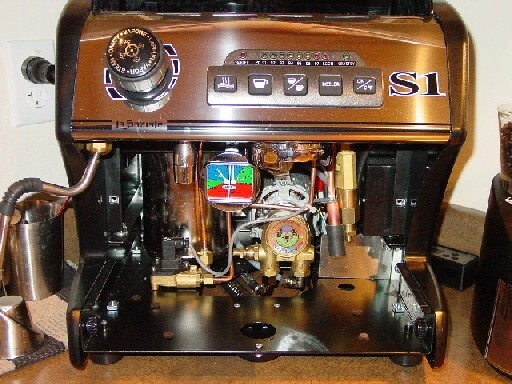 I did a side-by-side comparison with the VII and my old Gaggia machine. No comparison really. Bottom-line...this first day experience was great! Should I be waiting for the other shoe to drop?? I sure hope not 'cuz I L-O-V-E this machine. viewtopic.php?t=310 my machine has been trouble free so far. I picked mine up so no tweaked manometer or shipping issues. Hating to say this because of the power of evil to punish when one least expects is, I will nevertheless say that my machine has been everything it should be. Maybe the drip tray fill slowly when I'm not looking, but it isn't enough of a threat to track down the cause. We welcome you to the S1 Cafe! Nice to have you share all the positive energy you've written about the machine so far. It sounds like you got short-tubed, Chas wrote about his VII having the same little problem but all he did was bend it over the tray like you did. eprolix wrote: Also noticed the drain pipe from the 3-way valve was spitting water just outside the drip tray. With some careful tugging and repositioning, that problem is resolved as well (though I'd like to extend that copper spout about 3/4 of an inch to minimize splash...any ideas out there?). Just slip a short piece of rubber hose (fuel line/water hose?) over the end of the pipe to extend it into the tray. I have the same issue with mine as well and have been trying to get around to fixing it using a short piece of vinyl tubing. I have a variety of sizes from my beer making days which is all intended to handle hot water. So it should be just a matter of finding a piece with the right diameter. Diameter has been a problem for me. I tried a number of different sized copper fittings, nothing seems to fit quite right. I'm guess the copper is a funky metric measurement. So a snug piece of vinyl tubing may be the answer. I plan to give that a try. eprolix wrote: Diameter has been a problem for me. I tried a number of different sized copper fittings, nothing seems to fit quite right. I'm guess the copper is a funky metric measurement. So a snug piece of vinyl tubing may be the answer. I plan to give that a try. After trying in vain to find (what I thought would be) a simple copper coupling to extend the 3-way valve drain, I started looking for something flexible. But what would be able to withstand whatever heat the beast generates? Then I had a thought. I stopped at the auto-parts store on my way home last night and bought a length of water hose for an automobile. Surely that could stand the heat. It was marked both 1/2" AND 13mm (1/2" being the ID of the hose and the approximate OD of the drain pipe on VII). Got it home, snipped off an inch and a half, and it slipped on snugly. I now have just enough clearance to pull the drip tray out if necessary. JohnB wrote: Just slip a short piece of rubber hose (fuel line/water hose?) over the end of the pipe to extend it into the tray. I think my VII 3-way pipe was even shorter than yours. I probably added another 1/2" to get to the length of yours. BTW: with the 3-way extended to this length it is just about identical to the length of the copper pipe in my former S1. I never had any drip problems with the S1 because of that extra length. The problem is that the water really sprays out of there when the 3-way kicks in. Without the end of the pipe being right over the the drip tray, water goes right over the edge of the tray no matter how you try to redirect the pipe. Like you, I am high and dry after this mod. Thanks for helping me get around to it. I've known just what I needed to do and that I probably already had the right size tubing for the better part of a year. Guess Ill take this machine off my short list. How is something like this not noticed during testing? ?